Everybody has heard of goulash, right? You know — that hearty meat stew with a thick, rich gravy spiced with paprika and caraway seeds. And a flavor that goes on until next week. Well, guess what? That stew is actually called pörkölt (pronounced pur-kult). Goulash (gulyás), although made from similar ingredients, is a soup. No thick gravy in sight. But the flavors of the two are similar. You can use almost any meat to make pörkölt. In Hungary, pork or veal often star in this dish. In the US, beef tends to be what cooks reach for most often. Its flavor becomes delectable when braised in a long-cooking dish like this. You can make pörkölt ahead, and reheat just before serving. Dish it up with a side of Homemade Spätzle, and you’ll be the most popular cook in the neighborhood. This dish gets its flavor from well-browned onions and beef simmered in paprika-flavored liquid for at least two hours. Although recipes for pork or veal pörkölt often specify water as the simmering liquid, for beef I prefer to use beef stock — it adds more flavor. Paprika gives this dish a lot of its characteristic taste, so you want to use high quality, fresh paprika. If your paprika is more than 6 months old, it’s probably lost much of its flavor. In that case, I’d toss it and get a new container (it’s not that expensive). If your supermarket carries imported Hungarian paprika, it’s worth buying for this dish. My recipe is adapted from one that Susan Derecskey presents in The Hungarian Cookbook. This recipe serves 6 to 8, and leftovers keep for several days in the refrigerator. It’s a bit hard to estimate preparation and cooking time for this dish, because it depends partially on your skills (and how large a skillet you have for browning meat). Cutting up the meat and chopping vegetables might take 15 minutes. Browning the meat usually takes me at least half an hour, often a bit longer. Braising time for the meat is 2 hours, largely unattended. As noted up top, Homemade Spätzle is a wonderful (and traditional) accompaniment for this dish. And to start the meal, Hungarian Cucumber Salad would be ideal (and again, traditional). Peel the onion and cut into ½-inch dice. Place a 3-quart Dutch oven (or similar heavy pot) on a burner, and heat on medium until hot (about 2 minutes). When hot, add 1 tablespoon oil and allow to heat (it will ripple when ready; this takes only a few seconds). Add the onion, salt and pepper to taste, and turn down the heat a bit. You want the onion to turn quite brown — this will take at least 15 minutes. Meanwhile, peel and mince or slice the garlic. Add it to the onion during the last few minutes of the onion’s cooking time. While browning the onion, you can also begin browning the beef chunks. The better the crust you put on the beef chunks, the tastier the stew will be. Cut the beef into cubes of about an inch (remove excess fat and gristle as you go). Pat the beef chunks dry with paper towels (wet beef doesn’t brown), then lightly salt and pepper. Heat a large skillet on medium until hot (about 2 minutes). Add about 2 tablespoons of oil, allow to warm (this takes seconds with a hot skillet; the oil will ripple when ready), and add a few chunks of meat. Start with just 4 or 5 chunks at first, because the fat cools as you add the meat. When the fat returns to heat, add as many beef chunks as will fit comfortably in the hot frying pan. Do not crowd! The chunks should not be touching (if they do, they’ll steam rather than brown). Brown each chunk until the first side is a deep brown, then (using tongs) turn and brown another side. This will take at least 5 minutes for the first side, a bit less for subsequent sides. As each piece becomes fully browned, remove it to a plate that has been lined with a paper towel (to absorb excess grease). Add another piece to the skillet in its place (easy to do when all the pieces are cut to a uniform size — you know the next piece will fit). Continue (adding more oil if necessary) until all the beef chunks are browned. When the onions and beef are browned, add the beef to the Dutch oven containing the onion and garlic. Discard any remaining oil from the skillet you used to brown the meat. You should have a nice, brown crust on the bottom of the frying pan. Check to make sure the pan crust isn’t burned (if it is, discard it). Add a cup or so of beef stock to the skillet and deglaze the pan: Using a spoon or wooden spatula, scrape the brown crusty bits off the bottom of the pan until they dissolve in the stock. When the crust is dissolved, add it to the Dutch oven with the onions and the meat. Add enough beef stock to barely cover the meat. Add the paprika, caraway seed (crush with the back of a spoon to help release its flavor), and dried marjoram. Bring to a simmer, and simmer for an hour. Meanwhile, clean and seed the green pepper, and cut into strips. At the hour mark, add the green pepper to the pot (just lay it on top). Open and drain the canned tomatoes, and add to the pot (again, just lay them on top). Add more stock if necessary, and continue simmering until the meat is tender (this should take about another hour – 2 hours total cooking time). If you wish to thicken the gravy, mix corn starch with cold water (make sure you completely dissolve the corn starch). Remove the Dutch oven/casserole from the heat, and add about half of the corn starch mixture. Stir to incorporate — it will thicken almost immediately. If the sauce is still not thick enough (it may not be), add more of the corn starch mixture until the sauce is as thick as you like. Taste, adjust seasoning, and serve with an optional garnish of chopped parsley sprinkled on top. Beef stock is really better than plain water in this dish, IMO. You can either use canned beef stock, or dissolve some beef base in hot water. Beef base is a paste sold in jars. I find it superior to canned stock (and much superior to bouillon cubes). Most supermarkets carry this product in the soup aisle. My favorite is Better than Bouillon, although there are other good brands out there (I have no association with this brand other than being a happy customer). If you want to make a pork or veal pörkölt, you can follow this same basic recipe. Use water instead of beef stock, but otherwise everything else is the same. Traditionally, the stock for this dish isn’t thickened. If you prefer to do so, however, cornstarch makes a good, flavor-neutral thickener that’s quick and easy. It also adds a bit of glossiness to the dish, which some regard as a positive, others as a negative. The pictures in this post include examples with and without the thickened gravy. If you don’t have caraway seed, you really should get some to make this dish. Caraway seed adds a little flavor on its own, but when combined with paprika, the effect is startlingly good. It’s really not an optional ingredient in pörkölt. Paprika is an important spice in Hungary, and many Hungarian recipes require it. Hungarian paprika is often rather hot, but there’s a sweet version available (it has the same flavor, just not the heat). The sweet variety is what I see most often in supermarkets. Pörkölt and gulyás are two traditional Hungarian dishes that use paprika. But gulyás has much more liquid and often contains potatoes. Noodles, not spätzle, are the typical accompaniment. There are two other Hungarian stew-like dishes that contain paprika and have a flavor similar to pörkölt. One is Paprikás Stew, which is usually made with chicken or veal (it’s essentially pörkölt with sour cream added at the end). Probably the best known dish of this type is Chicken Paprikash (a/k/a Chicken Paprikás; also called Paprikás Csirke). The other dish, called Tokány, contains meat that often is cut into pieces about 2 inches long but only a quarter of an inch thick. It contains very little added liquid — the meat essentially stews in its own juices. The most famous example of this dish is Seven Chieftians Tokány (Hét Vezér Tokány). According to legend, this dish got its name because each of the seven tribes of Hungary contributed an ingredient. Our Hungarian feast was in full swing at Kitchen Riffs central. We had finished our Hungarian Cucumber Salad and moved on to the main course: Beef Pörkölt served with our own Homemade Spätzle. “They’re both super,” I said, glancing across the table. Our napkin pact! Something we always invoke when eating this dish. “Thanks,” I said, wiping gravy away in the nick of time. Ah, pörkölt. Eat it with someone you trust. Once again, a dish to drool over! Let the good tastes roll! or dribble or drip, I'll be there! Who needs napkins?! I have a somewhat secret obsession with all things paprika. I have to try this! My mother made this once for 200 people. She served it at a business party that was divided over two weekends. It filled our freezer for probably years. She served hers with a dollop of sour cream on top. This is something I will never forget! Hi Beethoven, you're such an enthusiastic - and neat! - eater that I'm sure you don't have a problem with dribbles. ;-) Thanks for commenting. Hi Alyssa, looks like your obsession is now out in the open! I'll bet you like this. Thanks for the comment. Hi Abbe, the sour cream is a good idea, although it's bordering on a paprikás-style recipe. Although who cares what you call it as long as it's good? ;-) Thanks for the comment. Oh Goulash! Lovely meal, and one can never have enough of it! That pepper add such a distinct flavor that you would never miss the place that serves goulash that day! I've seen that pepper appear on US markets already, on Farmer's Markets it is (here I mean a fresh pepper that is used in goulash with paprika). This looks wonderful. I think something like this is really hard to photography attractively but you've done a spectacular job, BRAVO! The flavor of paprika in the sauce sounds so great! I'm newly inspired to attempt cooking up something Hungarian. The homemade spatzle looks fantastic too. Hi Marina, isn't this such a wonderful dish? I enjoyed this so much, I'm pretty sure I'll be making it again soon! Thanks for your comment. Hi Uru, if you ate meat this would be guaranteed to disappear in a jiffy! Thanks for the comment. Hi Charlie, this really is a wonderful cold weather dish! And it's fun to wear it on your chin. ;-) Thanks for the comment. Hi Chris, it really is a great dish. And brown things can be a challenge to photograph, can't they? Thanks for your kind words, and your comment. Hi Lisa, Hungarian food is really wonderful. Less well known in the US than it deserves to be, IMO. Thanks for the comment. Hi Amy, this dish is really excellent with pork - that may be the best way to make it. Although the beef is awfully good. Thanks for the comment. Hi Nami, this is really a wonderful dish - so full of flavor. A lot of Hungarian food is similar to Austrian and German food (although not as heavy as some German food can be). It's worth exploring! Thanks for the comment. 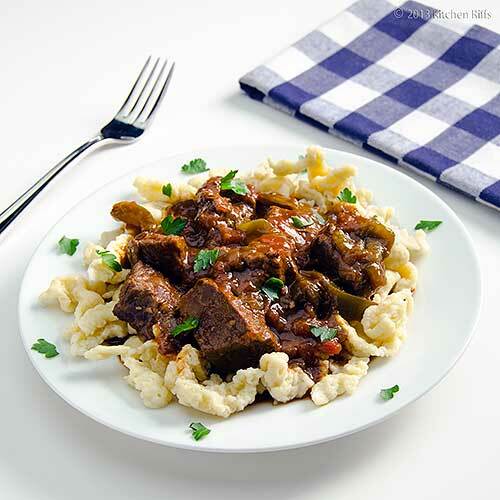 Spaetzle and now Hungarian beef stew? You are taking me back to my European vacation where I ate the best meals ever! My goodness I need to make this stew soon because it is totally one of my favourites. Hi MJ, this dish has your name on it - I think you'll really like it. Your homemade stock will be wonderful with this! Thanks for the kind words, and the comment. Hi Natalie, always happy to help you relive your vacations! Since you ate it at the source, you know how wonderful this can be. And yes, you need to make some. ;-) Thanks for the comment. I can just imagine how that beefy sauce gets soaked up by all that wonderful spatzle, too. What a dream dish to dig into. Years ago, I had a recipe for goulash that was a favorite. I served it at dinner parties and was even asked to bring it to potlucks. I lost it somewhere along the line and never found a suitable replacement -- until now, that is. This sounds like it would be even better than the one that I made and I'm all for it. Best of all, I've all of the ingredients, though it's pork in the freezer, not beef. That's fine with me. I'll still have a delicious dinner and, as a bonus, a bit more space in the freezer. You've share some great Hungarian recipes, John, and I really do appreciate the time and effort you put into these posts. Thanks! This dish sounds hearty and delicious. Perfect for these winter days. Hi Carolyn, this dish + spätzle = happy, happy mouth + tummy! Really good stuff. ;-) Thanks for the comment. Hi John, losing one's goulash recipe is a tragedy! In my book, at least. ;-) This is a pretty good dish - I think you'll be happy with it. Thanks for the comment. Hi Dawn, isn't this nice for cold weather? We're going to try to sneak it onto out table one more time while the weather is still wintry. Thanks for the comment. I love goulash, we always eat it in Germany after a long day of skiing. Your stew looks delicious, my mouth is watering just looking at the photos! Hi Kristi, it's wonderful, isn't it? And so nice that you got to eat it in Germany - I'll bet that was wonderful! Thanks for the comment. I made Hungarian goulash a few years back and liked it, but it didn't receive rave reviews around our table. I think this is a better recipe, so I'm going to try it again. I agree with you wholeheartedly -- stock is always better than water in applications like this. Hi Judy, I hope this recipe works for you! Do try making it with spätzle - the combo of the two dishes really is wonderful. Thanks for your comment. Comforting and scrumptious! I am a big fan of stews and of this spice. Perfect when served with spätzli. Your stew looks delicious. My mom used to make goulash, and it's one of those dishes I've never made on my own. With your recipe, hopefully I'll change that! Hi Rosi, great stuff, isn't it? And totally perfect for cold weather! Thanks for the comment. Hi Abeer, Hungrian paprika is super stuff - worth seeking out. And this dish is totally fabulous! Worth making. ;-) Thanks for the comment. Hi Beth, this is really a nice dish. I think you'll like it, and because I know in Canada you still have several weeks to chilly weather, plenty of time to make it this season. ;-) Thanks for your comment. Eat it with someone you trust, lol. My husband would love me for fixing him this. If anything has the words beef and goulash in the title he is all over it. Might have to get some fresh paprika. Hope you guys are having a great week. Hi Gina, that napkin pact comes in handy! ;-) Do get fresh paprika - all spices deteriorate with age, but that seems to me to be one of the most susceptible, so a fresh container is really worth it. Thanks for the comment. Oh, my...this is comfort food at its best! 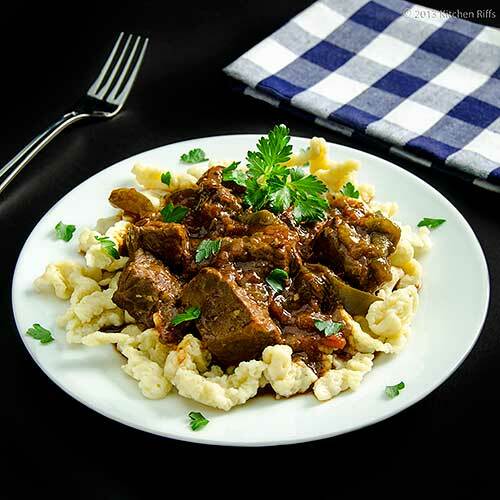 Stew over spaetzle...irresistible!!! Hi Anne, it's a wonderful dish! And you're right - it's quite straightforward to make. You might be able to use a cookie press to make the spätzle - definitely something worth trying. I've known of people who use a ricer (using the disc with large holes) to make their spätzle. Thanks for the comment. Hi Liz, it really is pretty irresistible! So much so that we plan to make this again in a week or so. ;-) Thanks for the comment. Hi Cathleen, now you know! And you definitely should try making a stew sometime, IMO - great comfort food! Thanks for the comment. Wow, it looks so beautiful and delicious ! Hi Sketched Chef, it's really a luscious dish! Thanks for the comment. Hi Ray, if you had "goulash" in the US, it was probably pörkölt, or a variation of it. Most of the goulash in the US isn't soupy at all, but very much a stew (there are exceptions, of course). Anyway, it's a great dish. Thanks for the comment, and I hope you have a good weekend, too. Hi Bam, the spätzle can be either tender or chewy depending on how you cook them. If you cook them a minimal amount of time, they'll be quite tender. If you cook them longer - particularly if you cook them, cool them, then brown them with butter and cheese - they tend to get chewier. Good both ways, IMO, but the tender ones kinda melt. Totally wonderful! Thanks for the comment. My husband would just let it drip where it may, he's very big on beef stews and such, and would be totally engrossed in eating. This looks really fantastic! I love the colour on the meat and of the overall stew. Hi Nazneen, left to my own devices I'd probably let it drip too! This is a great stew, and I agree the color is wonderful. Thanks for the comment. You always have such interesting and informative blog posts. I had no idea that goulash was actually a soup. Either way, this looks delicious with your spatzle. Hi Kristi, food is so interesting, isn't it? Always something new to learn! Thanks for the comment. I used to make something like this! Although I used a lot of sour cream with paprika. Thanks for reminding me! I really enjoy these wholesome meat dishes. Some years back we had hungarian goulash in Hungary and it was pretty much the same as what we had always made, which is not always the case. Most dishes we eat don't resemble those from the country of origin. Hi Julia, the sour cream version really sounds delish - I should try that version sometime. Thanks for the comment. Hi Suzanne, it's definitely true that a lot of dishes get lost, or changed quite a bit, in translation. By and large Italian-American cooking only superficially resembles the food made in Italy. Both are good, but different. Thanks for the comment. Thanks for the Hungarian food primer! 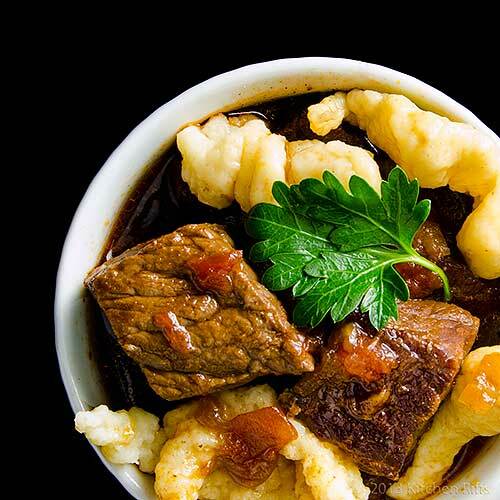 My dad (whose mom was Hungarian) made something like this (which we of course called goulash) on occasion growing up. So good! Looks amazing with the spaetzle. That looks so delicious John! I've made a goulash just once, as it didn't turn out the way it was meant to...maybe I should give this a try! HI, very interesting recipes and tips. This is something new to me but it sure look inviting and mouthwatering. Excellent click, like from food magazine. Hi Katherine, actually, I always call this goulash too! ;-) The name might not be technically correct, but everyone knows what I'm talking about. Thanks for the comment. Hi Ali, this is definitely worth trying. And it's pretty foolproof, IMO. The trickiest part is browning the meat and onions - after that, the dish cooks itself. Thanks for the comment. Hi Amelia, it's a great recipe, and quite tasty. Thanks for the kind words, and the comment. Hi Terra, this really is such a nice dish! I'm making it again soon. ;-) Thanks for the comment. Nice and hearty, I love those large chunks of beef! Hi Raymund, those chunks of beef eat even better than they look! Thanks for the comment. When I opened up the picture my first thought was how great it looked and that it looked like you prepared the spätzle within it! My mom use to make something like this. And this looks superb. I love it. 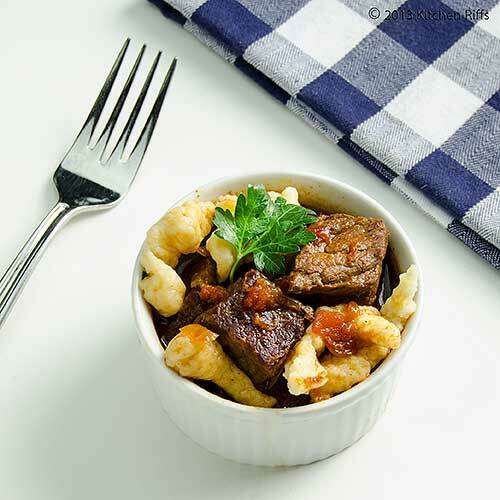 This fabulous goulash recipe reminds me of my chef exam 28 years ago. We had to cook a 4 course menu including an original goulash from scratch. One of the ingredients necessary to pass the exam with a perfect score was lemon peel. Of course no one added lemon peel. That said I don't think lemon peel is necessary. Excellent recipe and great information about the cooking procedure. Well done. Hi Judy, since your mom made a similar dish, you know how wonderful this can be! Thanks for the comment. Hi Frank, hmm, lemon peel? That's new to me, although I'm not far from an expert in this dish. Sounds kinda good, actually. Thanks for the kind words, and the comment. This dish definitely speaks to me. I see a lot of similarities between goulash and Chinese beef stew - lots of spices, slow cooking, spicy, use of cornstarcn:) So my new task is to cook the goulash and spatzle and serve them together. Thank you for this wonderful recipe! Hi Yi, it is a reasonably similar dish to Chinese beef stew, although of course some of the spices are different. Stew is basically stew no matter the language! And this is a particularly nice one. Thanks for the comment. Hi Sybaritica, spätzle is wonderful and this dish more than any I know combines so well with it. Definitely worth making. In fact, I'm making it tonight! Thanks for the comment. I was actually just thinking about a Hungarian Goulash I once made. It really is such a great winter comfort food. Yours looks great! Hi Jamie, isn't this a great dish? We had it again last night - this time with pork. Thanks for the comment. The flavours of this look divine. I've never made a Hungarian stew before but this looks so tempting that I must give it a try! Hi Christine, it's really a wonderful flavor. Subtle spiciness - nothing overwhelming. Thanks for the comment.